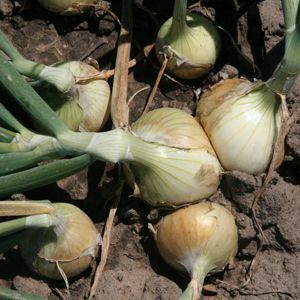 Onion is a biennial or perennial plant; the bulb itself is an underground part of the stem, the above-ground part of which is hollow and blue-green. The leaves are the same color and hollow, but shorter than the stem. They dilate to surround the stem at the bottom. Greenish-white flowers grow in a rounded, umbellate cluster from June to August, producing tiny bulbs as fruit. Other varieties: Egyptian onion (Allium cepa var. viviparum) makes bulbs on top of plant as well as bottom of plant; Welsh onion (A. fistulosum) has multiple shoots with many flowers, Chinese called this onion Ts’ung; Elephant garlic (A. ampeloprasum) has tall stalks with large, showy, white flowers; Chinese chives (A. tuberosum) grows in clumps of long thin leaves; Chives (A. schoenprasum) grows in clumps with long, thin, grasslike and hollow leaves; Ramp (A. tricoccum) resembles poisonous lily of the valley, do not confuse them: Giant chives (A. sibericum) also known as Chinese chives. Mostly cultivated but also found wild in numerous varieties. Onions grow along streams and are found on mountains. 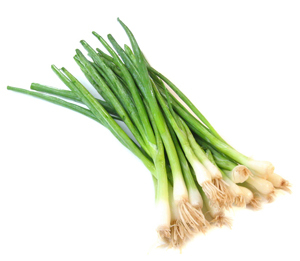 Wild onions are gathered in May and June. Eaten as they are found, both bulbs and leaves, after washing. Onions were a favorite food of the Egyptian slaves. According to the Greek historian Herodotus, 9 tons of gold was given in payment for the onion consumed by the slaves building the great pyramids. The Egyptians themselves held onions in high regard, for Pliny reports that they “make their oaths” by garlic and onions. 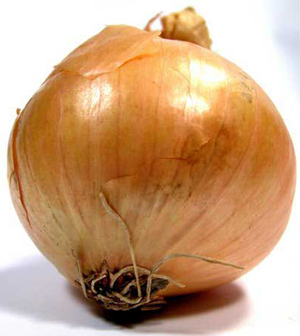 The regarded the brittle brown skin which envelops the onion bulb as a symbol of the universe. Later, Europeans had a practice of suspending onion slices in each room to purge “evil spirits” from a house. The slices were collected and burned each day. One herbalist recorded a story attributing the immunization to garlic. The conflicting stories serve to demonstrate the inherent similarities of the two herbs. Culpeper noted onions served as well as garlic. Try eating parsley to avoid onion breath. Or Chlorophyll tablets can help eliminate the odor. Personally, when I was a child, my uncle had a pet spider monkey. Every now and then, he would give the animal, named Chipper, a raw onion. Chipper would scrape the layers of the onion to get the juice out and would rub it on himself to neutralize the “monkey odor.” Interestingly, it actually did work. Onion juice (or a decoction or extract) is used as a diuretic or expectorant agent, but it has been used for ages for the other purposes indicated. Boiled, it is used to eliminate fluid retention in the system. 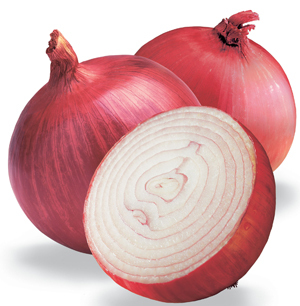 Onion helps to end putrefactive and fermentation processes in the gastrointestinal tract. It is said to strengthen the heart and tends to lower blood pressure, good for scalds and burns; blemishes, spots, calluses, warts, athletes foot, sprains, piles, and marks in the skin. Helps restore sexual potency which has been impaired by illness or mental stress, increases sperm. Half an onion cut small and eaten with bread will relieve gas pains and heartburn. Onion juice mixed with honey is good for colds, flu, hoarseness and coughs. Externally, onion juice can be applied to suppurating wounds or sores, boils. For gout, thrombosis, and diabetes, high cholesterol, helps prevent blood clots, helps restore sexual impotency, as well as hardening of the arteries, onions as a food are a vital part of the treatment. Onion has a good effect on appetite, dandruff and loss of hair, colds, flu, hay fever, whooping cough, laryngitis, yellow fever, pneumonia, fever, colic, bladder cramps, earache, headache, chill, kills worms, and toothache. Place fresh slices on insect stings for rapid relief. Also use to relieve nettle rash or hives (urticaria) caused by food allergies. Juice: take 1 tsp., 3 or 4 times a day. To make onion juice, puree one raw onion in a blender or food processor and strain through a cheesecloth. Store in the refrigerator. For colds, mix warm juice with 2 tsp. honey. Cold extract: soak a chopped onion in 1 cup water for 24 hours and strain. Take 1/2 cup per day. Decoction: boil a medium-size, chopped onion in a little more than a cup of water until 1 cup liquid remains. Take 1 tbsp., several times a day for several days. Breast-feeding an infant, mothers should avoid onions because they could cause the baby to suffer colic.